Virgin Trains’ customers are a step closer to new trains as work begins on the Azuma (Class 800) fleet, due to enter service on the east coast in 2018. Work on the bodyshells is taking place in Kasado, Japan, before the trains arrive in the UK to be built by Hitachi’s manufacturing team in Newton Aycliffe. Hitachi’s UK train manufacturing team on Aycliffe Business Park is now home to over 900 employees including more than 50 apprentices. UK build work on the Virgin Azuma will begin this summer. The Virgin Azuma will transform travel and customer experiences when it arrives on the east coast main line next year. The fleet of 65 trains will provide an extra 12,200 seats, and faster journeys will make direct routes to new destinations such as London-Middlesbrough possible, as well as a big increase in through services from London to places such as Bradford, Harrogate and Lincoln. Hitachi Rail managing director Karen Boswell said: “The new Azuma fleet will be a combination of Japanese design and British manufacturing. David Horne, managing director of Virgin Trains on the east coast, said: “We are very excited to be moving closer to the day when our fantastic new train comes into service. New Intercity Express trains built in Newton Aycliffe have completed their first journey in ahead of entering passenger service later this year. Hitachi, the company building and maintaining the new fleet from its purpose-built factory on Aycliffe Business Park, successfully ran the test train along the Great Western main line to Wales. The train ran through the Severn Tunnel, Newport, Cardiff, Bridgend and Port Talbot before finishing at Hitachi’s purpose built train maintenance centre in Swansea. The new Intercity Express trains will bring a step change in passenger experience, offering passengers more seats, more space and better on-board technology. From autumn 2017 the trains will connect Wales to London Paddington and major English cities such as Reading, Bristol, Bath and Swindon. Each of the new trains will be bi-mode, allowing them to switch seamlessly between diesel and electric power. This means even whilst modernisation of the Great Western route takes place, passengers will still be able to benefit from the new trains. 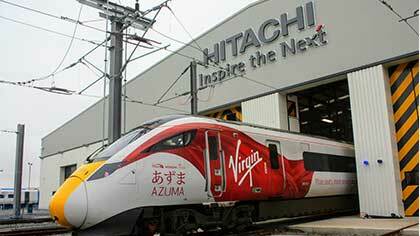 The new trains for Wales are being built at Hitachi’s train assembling facility in Aycliffe. Using their famous Japanese bullet train technology, Hitachi’s intercity trains will offer the very best in build quality and reliability. The trains will become a common sight in Wales as test activity increasing over the coming months. Hitachi Rail managing director Karen Boswell said: “Our new intercity trains will bring rail travel in Wales firmly into the 21st century. “These modern trains are being built in Britain using pioneering Japanese bullet train technology.